Not since Throne of Blood has an arrow made such an impact in cinema. Yu Ha's A Frozen Flower (Ssang-hwa-jeom), loosely based on the reign of Gongmin of Goryeo (1330-1374), begins as a serene period film - tea flows, music pours from instruments and the Land of the Morning Calm is indeed just that. The splendour of the period, the ornate designs and genteel surroundings lull us into a sense we may be in the midst of a Korean Jane Austen novel - tension brewing under an outward demeanor of placid civility. And then, with a jolt, tranquility is broken with immediate and shocking effect - an arrow lodges itself in a servant's head mid tea-pouring. This isn't simply a sforzando or a jump-scare to startle the audience. It is a signal that everything is about to change - its a sign that Yu Ha won't necessarily sign-post actions before they occur. In a split second, A Frozen Flower has told us to forget all we suspect about the language of cinema and to give one's self over to the tale with a resigned, and liberating, surrender. This is a rather appropriate statement for a director who has no qualms with swapping between genres throughout his oeuvre and often combining stylistic elements from each in euphoric new ways (not least in his sigh-school martial arts drama Once Upon A Time In High School). Here Jo In-seong stars as Hong Lim - guard and trusted confidante of the King (Ju Jin-mo). The pair are openly lovers - a poorly kept secret known to all including the Queen (Song Jie-hyo). So, when the King, under pressure from the Yuan kingdom to sire a heir, struggles to conceive a child with his wife, a plan is hatched - Hong Lim will take his place and impregnate her instead. It is during such a tryst that Hong and the Queen realise something unmistakable; they have fallen for one another. The King, jealous and full or rage, is stuck between two positions - punishing the betrayal and risk losing his sovereignty to the Yuan kingdom or tolerating his wife and lover's affair. A Frozen Flower is not a feature which troubles itself with subtext for the most part but, in its place, Yu Ha has crafted a tightly woven and intricate tale of lust and greed. A love story in which power, rather than romance, often becomes the driving factor, the Korean period piece is remarkable in the manner in which it ramps up the tension to unbearable degrees. Often anxiety is imbibed in images which, in their historical detail, are too captivating to tear our eyes away from. 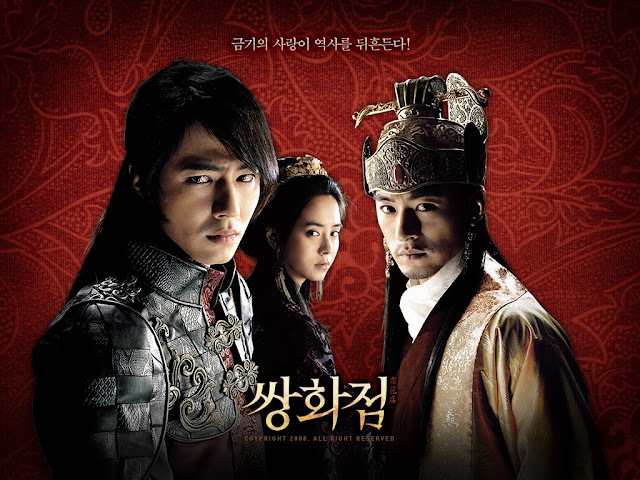 Masterly choreographed (something which will be of no surprise to anyone who witnessed the climatic fight scene in the aforementioned Once Upon A Time In High School) and lensed with a painter's eye, A Frozen Flower takes the key elements of modern Korean cinema and applies them to a historical framework. A melodrama of characters at the extreme ends of their emotions, pushed to the most extreme situations imaginable. A must watch for fans of wuxia and Korean cinema alike.